Last year (2006) when we left the move Cars, my son, Noah, told me he would like to make the Lightning McQueen car next year for the Cub Scout, Pinewood Derby. I was thinking the whole time that lightning McQueen has a lot of stickers that I would need to resize to get them to work with the pinewood car. When we were working on the design, after the movie came out on DVD, Noah decided he wanted to make the Whitewalls McQueen (a.k.a. Crusin McQueen) car. I was relieved, then we decided to make a car for Mom (Flo) and me (Doc Hudson) I had worked getting the plans to fit the max width of 2 ¾” and the max length of 7” and the standard Cub Scout pinewood derby wheelbase (Flo has an altered - shorter - wheelbase). In the last week, before the derby, we worked a long time to get the cars ready and we needed to build a carrier in the toolbox to house the cars in transit. I worked until 2:00am the night before the race to get my car completed (even though it still does not have bumpers, maybe someday). At the races another father and son made Mater and The King as their cars. Our cars did well in the races, Noah was 1st place in the wolf den, 2nd fastest in the pack. All of the scout and parent cars were beat by a pink Girl Scout car in the Cub – Parent races. During the fall it was time for the Cub Scout cake auction we were tasked with making a cake with a Cub Scout theme. After some thought we decided to make a pinewood derby cake, since we made Cars, Pinewood Derby cars for last years derby [link=p067.ezboard.com/Cars--Pinewood-Derby-cars/fcarsthetoysfrm12.showMessage?topicID=168.topic newwindow]Cars PWD cars[/link] we decided to add our cars to the cake. 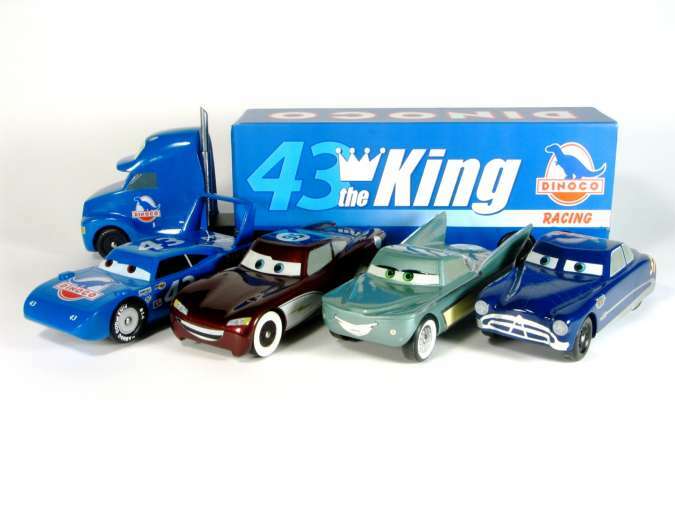 We picked up a Crusin McQueen, a Doc Hudson and a Flo 1:64th scale cars and modified them to look like our Pinewood Derby cars. We needed to shrink the original decals we used on our pinewood derby cars. We even added the bumper stickers on McQueen’s rear bumper, that don’t show up on the Mattel models. We also added more Cub Scout decals than our Pinewood Derby cars had on them. In the end we only made a 2 lane track, so Flo (Mom’s car) did not appear on the cake. Last edited by ah8tk on Tue Nov 07, 2017 8:22 pm, edited 6 times in total. No apologies necessary! Thanks for sharing your excellent work! Quick question, are your tailights, headlights, eyes, and decals are your own decals? All I can say, it that is some very nice artist work and detail. Those have to be some of the best PWD cars I have ever seen !! are your tailights, headlights, eyes, and decals are your own decals? All of the decals on these cars were redrawn, one of the troublesome details is that the eyes are 2 separate decals (as inkjet printers cannot print white) there is a white decal that has the eyeball and the white part of the eye, covered by a clear decal with the window frame. I spent a lot of time in toy stores trying to figure out how to redraw the decals. Last edited by ah8tk on Mon Feb 18, 2008 8:10 am, edited 1 time in total. I have seen your cars somewhere before. First it was the CARS website and then on the Coolest Car of 2007. I am very impressed still! PWD: The bug everyone catches and no one wants to let go. Last edited by ah8tk on Sat Oct 31, 2015 8:06 pm, edited 1 time in total. Thought about him, just have not tried to create him, yet! Other Cars just keep popping up. I have a design started for the Sheriff, but that is about it, for now. Dude, you got mad skills indeed. Thanks very much for posting. HA HA. Yep, you're definitely the only guy to ever stay up late night before PWD NOT! We need more long posts like this one - well done. Those are just amazing. I love the King. I made a dynoco mcqueen that would go nice in your big rig. Where did you get the big rig kit, I haven't been able to find one? I purchased it from the Scout Shop, 100th Anniversary Big Rig Truck. I guess you still cannot get them from scoutstuff.org, I just searched again. Amazing work - simply amazing.